…But a book I’ve been wanting to read for over a decade and somehow finally just procured has me realizing that – like with just about everything in the entire history of the world – there’s a lot more to “farm laborer” than milking cows and putting by crops for Pa.
I’m talking about The Confessions of Edward Isham: A Poor White Life in the Old South. If you have antebellum ancestors in the South, this book’s dissection of a short, brutal life will give you a first person peek into what those lives might have been like. Now, I’m not saying our “farm laborer” ancestors were all Edward Isham’s. Isham was a landless white man from Carroll County, Georgia who made his way through life working itinerant jobs and/or taking up with women. Oh and gambling. And a bit of robbing. Also lots of fighting. We know all of this because in 1859 Isham found himself on trial for his life for murdering a North Carolina farmer, who he claimed cheated him out of his fair wages. So, sure, not all poor white landless men in the South were Edward Isham’s, but the book does make a good case that fighting and frolicking were par for the course for pre-Civil War poor whites. For example, apparently men used to keep their nails long and sharp, as a handy eye-gouging weapon. Seriously. I’ll detail the things that struck me about this book, with an eye toward family history, in no particular order. As a student of American history, I vaguely remember all of those mini-depressions and financial crises the U.S. suffered through in our short history until the Glass-Steagall Act stopped that boom and bust cycle. (Until it was repealed. Don’t even get me started.) As they always are, these recessions were hardest on people who didn’t have much to begin with. Isham and his fellow laborers were no exception. Then add geography into play. Isham was born about 1826 and his father moved the family to Carroll County, Georgia after making a successful draw in the 1832 Georgia Land Lottery. By Edward’s own account, his father, Edward Sr., was a “dissipated” man who moved the family frequently and taught Edward how to fight at a young age. Edward grew up in Carroll County when it was a mining area and where a man could make a living independently scratching for gold. As Edward grew up, the wild Georgia frontier was slowly tamed, and the chances for a man to make his own way in the world independently slowly dried up. Many landless white laborers were forced to trade their mining kit for bosses and wage labor. 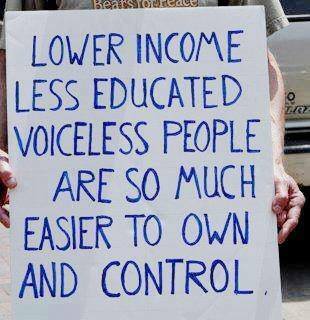 Oh, and then there are the other laborers in the South at the time – slaves. Interestingly, the paradox that landless white laborers faced back in the day reminds me of the paradox that “unskilled” workers of all kinds often face in the U.S. now. (I put “unskilled” in quotes because I’d say that breaking your back, enduring physical hardship and swallowing a whole lot of crap to keep a roof over your family’s head is certainly an admirable trait, if not a skill.) The jobs that would pay decent wages go overseas or to undocumented or otherwise disenfranchised immigrants willing to work for low wages, further depressing the economy. One hundred and fifty years later we don’t blame the enslaved for the state of the antebellum economy. Will it take another 150 years for us to figure out who to blame for today’s economy? Probably so. The editors make it plain that not all landless whites in the old South were like Edward Isham. For one, Isham took up with a lot of women but didn’t ever let any of them tie him down. Most other men weren’t so lucky… I mean, most other men worked alongside their nuclear families. In fact, when seeking out farm laborers, the landed gentry often looked for men with families because they could benefit from the labor of the wife and children as well. Single male workers like Isham were probably the least desired class of worker, but would do in a pinch if you needed a ditch dug or a fence built. The book includes Edward Isham’s 25ish page confession, and several essays parsing the document, including “Mothers, Lovers, and Wives: Images of Poor White Women in Edward Isham’s Autobiography” by historian Victoria Bynum. The editors posit, and I agree, that the marriages were probably common law rather than state sanctioned. He seemed to abandon his wives and consorts as he found better work opportunities. Interestingly enough, he does admit that some women had power over him. He courts one woman, leaves after some trouble with the law, comes back and steals her from her husband, finds himself cuckolded, and then apparently tries to get her back again but ultimately fails. Isham also shows a little tenderness toward some women in his life. His 3rd reported wife died in childbirth shortly before he committed the murder that eventually did him in, and he reports being feeling low and drinking a lot during that time. In other words, if you had any illusions of the prim and proper Victorian lady dwelling in the Georgia frontier, read this primary source for a clearer picture. Times were tough for everyone and people made choices about marriage and mating for a variety of reasons. Now, every time I come across a male ancestor living with another family in a census or a female ancestor living back home with mom and dad and her children, my imagination will add a more colorful spin to the circumstances. I’ll never look at the “farm laborer” or “laborer” occupation in the census the same way again after reading the Confessions of Edward Isham. I hope, if you come from a family of boring old famers and farm laborers here in the South, that you’ll give this amazing primary source a read, and then you won’t either. Bolton, Charles C, and Scott P. Culclasure, eds. 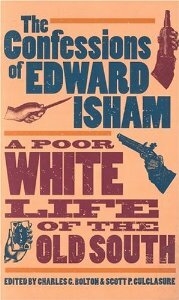 The Confessions of Edward Isham: A Poor White Life in the Old South. Athens, GA: University of Georgia Press, 1998. How did I miss a post with a Johnny Cash clip? Great post!